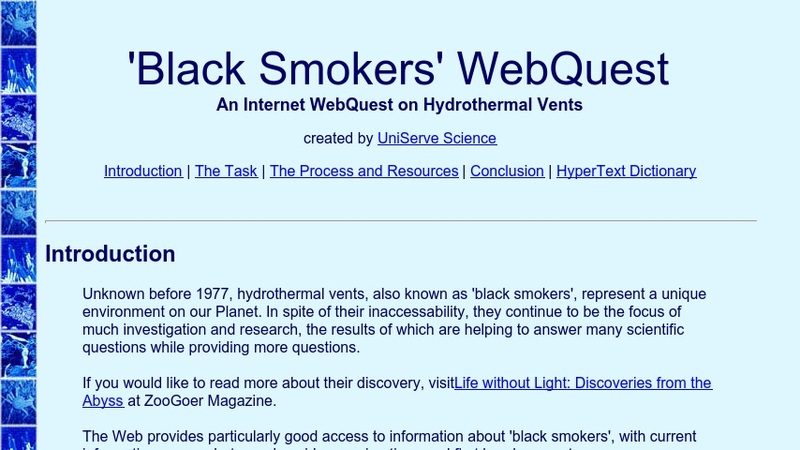 This website contains a black smokers WebQuest where students in groups investigate one aspect of the science of black smokers. The WebQuest provides a separate list of links for each research role, including geochemist, biologist, oceanographer, and geologist. Upon completing their specialist research, the students work in groups to get a better understanding of black smokers and the issues by presenting a position on whether to protect black smokers or continue research on the black smokers for possible benefits. The webpage is divided into the following sections: introduction, the task, the process and resources, conclusion, and hypertext dictionary. This site provides a wealth of information relevant to black smokers with current information, many images, videos, animations, and first hand accounts.